Commissioning of one 75,000 TPY corn oil refinery project built by Myande for Carepal Oil Co., Ltd of Tiancheng Group successfully completed. The successful commissioning of the project has set a solid foundation for Tiancheng’s strategic plan to go public in 2016 and will support and safeguard its program to strengthen “Carepal” brand. In addition, the completion of this new refinery line symbolizes a major step forward of Tiancheng Group in its globalization and capitalization process. 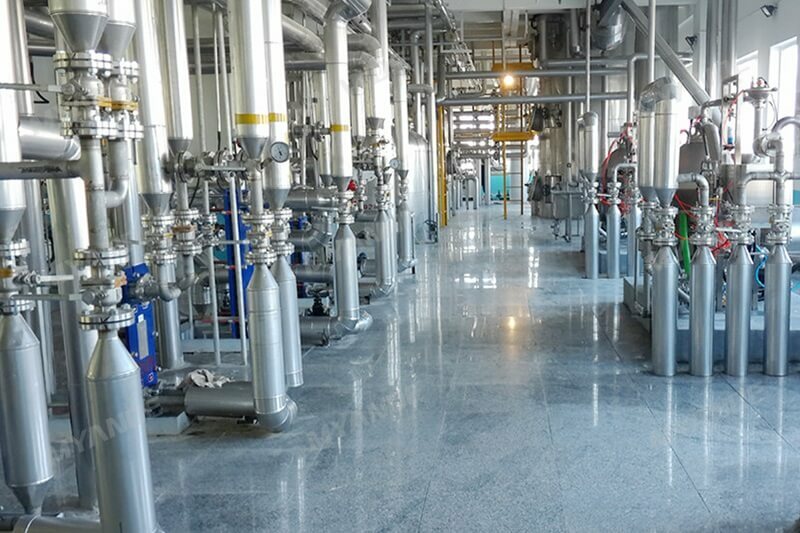 The process design of this new refinery line incorporates Myande’s rich experience gained from undertaking numerous refinery projects as well as the most advanced edible oil refinery technology with sufficient attention paid to the customer’s specific requirements. The project adopts Myande’s patented equalized-pressure deodorization tower system, which effectively dealt with high acidity and hard-to-bleach features of corn germ oil. All technical parameters of the final product are better than those specified in the contract. In addition, the Myande’s fully continuous dewaxing technology ensures that the freezing time of Grade I oil is far better than the national standard at 5.5 hours. 1. The incorporation of Myande patented falling film economizer ensures that temperature of old oil entering deodorization tower increases to 225℃ through heat exchange with hot deodorized oil. This effectively reduces consumption of high-pressure steam by making full use of heat from deodorized oil. 2. The falling film type economizer adopts the vacuum cooling technology that eliminates the need for extra mixing steam, and thus reduces steam consumption and load on the vacuum system. 3. In continuous and stable running mode, the complete refinery line requires almost no steam for oil heating purpose. 4. The deodorization vacuum system, adopting surface cooling water condensation vacuum technology, consumes only 1/3 steam as compared to the traditional four-stage steam ejector. Considering the geographical location of the project, the vacuum system is designed to use a cooling tower instead of chiller when the ambient temperature falls below 7℃. Myande has undertaken more than 110 oils & fats projects worldwide, including five 1,000 t/d (largest in China) refinery projects, many corn oil refinery projects, the largest rice bran oil refinery project in China and sunflower seeds oil and cotton seeds oil refinery projects.